Wednesday Wrap: Cambridge Audio G2, i-Box Slix, Lego turntable | What Hi-Fi? From two new, limited edition Cambridge Audio G2 finishes to the launch of the brand-new i-Box Slix portable Bluetooth speaker, here is the news in brief from What Hi-Fi? 's Wednesday Wrap. 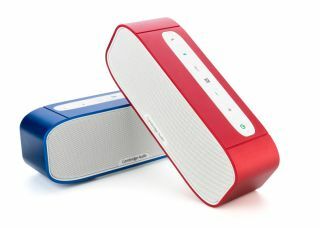 This week [26th November], we start with the news that Cambridge Audio's G2 portable wireless speaker is now available in two additional finishes – red and blue – just in time for Christmas. Available from Richer Sounds, John Lewis and direct from the manufacturer itself for £100 from the end of the month, the G2 delivers up to 10 hours of battery life and supports NFC one-touch pairing. UK tech brand i-Box has announced the launch of its new Slix portable Bluetooth speaker – available this month from £60 for one unit. You can also pick up a double pack for £100, with the Slix including a 'True Stereo Pairing' mode for those looking for stereo sound. Meanwhile, a 3.5mm cable will allow for wired connections. For those among us for whom Lego was a fundamental part of our childhoods, how about this – a gentleman from Korea has indulged his inner child and inner audiophile by creating this turntable. According to Mixmag, the fully-operational piece of kit has been crafted using 2000 pieces of Lego and is powered by a Lego Power Functions Battery Box. Only the turntable's phono cartridge is not Lego! A new agreement between Samsung Electronics America and NanoTech Entertainment will see the UltraFlix 4K streaming channel made available on the Korean manufacturer's UHD sets this month. It might only be a development that affects consumers on the other side of the Atlantic, but it is perhaps a sign that we're moving ever more towards accessible 4K content heading into 2015.